This Thursday January 16, 2014 at 2:00 pm EST I'll be sharing a preview of my 2014 presentation at IHRSA this year during a FREE IHRSA webinar (hope you will attend). The future health club is going to emerge soon and to understand what it might look like we only have to consider what is happening in retail. Be it Starbucks generating 10% of its total transactions now via its mobile app, or Apple eliminating the check out counter in its stores via its adoption of mobile check outs, technology is being applied to improve service and deliver customized experiences that bridge the divide between the digital and physical worlds while making customers much happier. As the future emerges business models that do this well will be the ones that will succeed because they are redesigning their models to address the new customer, one relying on mobile technology and one having all of the power. Cisco’s Inernet Business Solutions Group study found that a majority of consumers have advanced beyond the capabilities of most retailers and this is true for most health club operators as well in my opinion. Cisco’s Customer Experience Report documents that consumers prefer more automated and personalized digital buying experiences. By embracing mobile trends, where two thirds of U.S. adults have smartphones and use them to search and conduct commerce, smart operators will be able to deliver service and experience in new ways that will redefine business models. If you don't think these trends are relevant, check out the FIT-C 2014 U.S. Health Club Technology Survey Report. PSFK's recent report (below) on the future of retail in 2014 is something you should read, watch and think about because these technologies and new approaches are changing how businesses operationalize, market and service customers today. These trends are going to be included in future health clubs and it will completely change how the industry serves its customers. 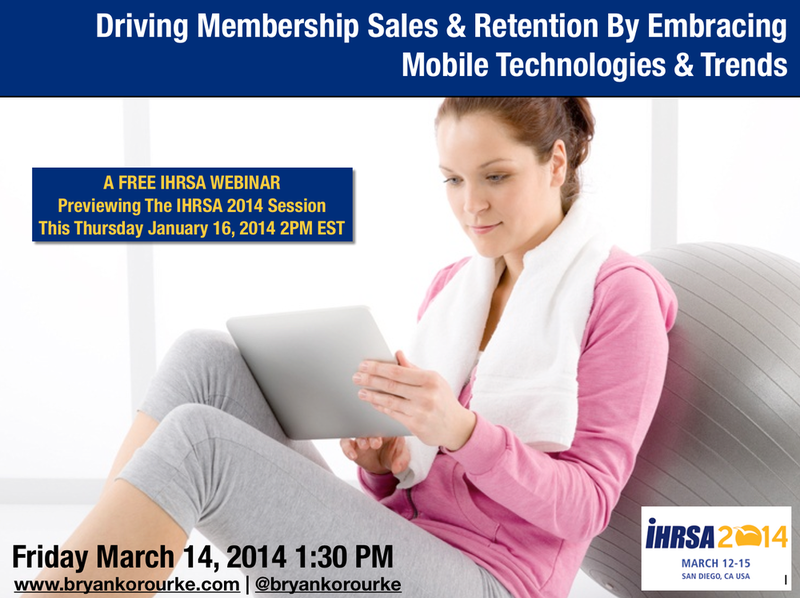 Please join me at #IHRSA2014 this year in San Diego on Friday March 14, 2014 ay 1:30 pm where I'll explore what the future of mobile means for the health club industry. What do you think? I'd love to hear your views. An increasingly competitive landscape is going to require brands to think about technology adoption and deployment around the customer to create better experiences. Do you agree ? Shouldn't we work together to make that possible ? Bryan O’Rourke is considered by many to be a thought leader on technology, health club and wellness trends. He has been quoted in global periodicals like the Wall Street Journal, and has been published in journals around the world on his views of how technology will create the dawn of a new era of opportunity for the health club and fitness industries. In addition to being an industry expert, Bryan is a technologist, financier, shareholder and executive in several fitness companies. He has spoken on a range of business and trend topics on four continents. As a contract executive and advisor, Bryan wears many hats, including working for Fitmarc, which delivers Les Mills programs to over 700 facilities in the US. He advises successful global brands, serves as a member of the GGFA Think Tank, on ACE's Industry Advisory Panel and is CEO of the Fitness Industry Technology Council. To join FIT-C visit www.fit-c.org . To learn more contact Bryan here today .